A game of hide-and-seek in the forest might lead to unexpected discoveries. Could there be something hidden in the trees? When their dog goes missing, siblings Poppy and Cy decide to play hide-and-seek in the woods to distract themselves. Poppy counts to ten and sets out to look for Cy, but she can’t find him anywhere. Deeper into the woods she goes, looking for her brother, until she hears a rustling noise nearby. What could it be? Surreal forest scenes heighten the mood of the story, holding plenty of hidden images to discover. Award-winning picture book creator Anthony Browne captures one of those childhood moments when imaginations get a bit carried away, then reassures readers with a comforting ending. 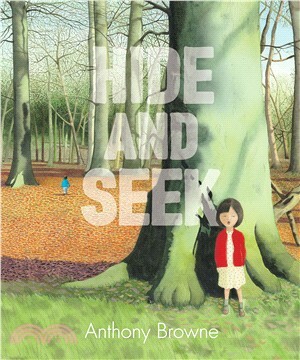 Anthony Browne is a former British Children’s Laureate, a two-time winner of the Kate Greenaway Medal, and the first British winner of the Hans Christian Andersen Award for Illustration. He has written and illustrated more than forty books, including Willy and the Cloud, Gorilla, What If . . . ?, and Little Beauty. Anthony Browne lives in Kent, England.